October 27th is designated World Day for Audiovisual Heritage by UNESCO. 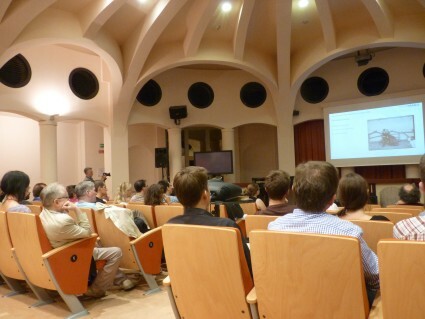 Had we enterprise enough and time, the Bioscope would have produced its own celebration of this event, but instead (and what is much better) let us point you to an exceptional resource produced for this day by the Museu del Cinema in Girona and Girona City Council through the Centre for Image Research and Diffusion (CRDI), with the collaboration of the International Council on Archives. 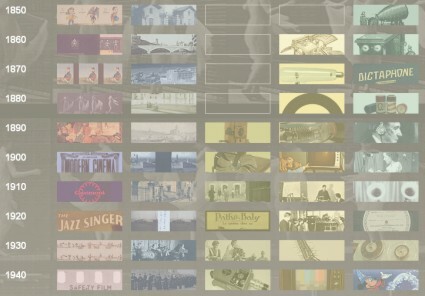 It is an online, interactive ‘poster’, entitled Audiovisual Heritage that provides a chronology of the historical development of the audio-visual media of cinema, photography, television, video and sound recording. Arranged by horizontally by decades and vertically by theme, it is a well-researched, well-illustrated, and compulsively browsable resource. Click on any box and a potted history pops up, with further illustrations, including some video demonstrations (also available through the Museu del Cinema’s YouTube channel). You can then explore that theme further by clicking through page arrows, or else return to the main arrow. The poster is available in Spanish, Catalan, English and French. For a list of World Day for Audiovisual Heritage events taking place worldwide, visit www.pia.gov.ph/wdavh2011. 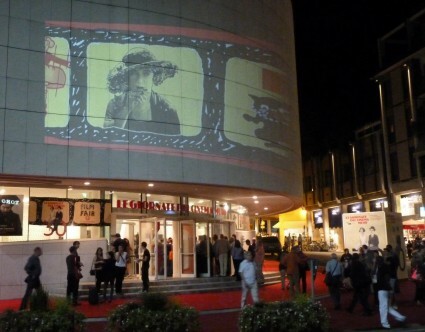 For the Bioscope’s own account of the Museu del Cinema from earlier this year, click here. In at 9.00 am – that’s my strategy, start early and watch ’til I drop – for Das Spreewaldmädel (The Girl From The Spree Woods) from the long-term Steinhoff Project, bringing Hans Steinhoff’s silent work back from obscurity. This year’s instalment was a rather delightful rural comedy, about a farmer’s fiancée being distracted by a handsome young officer billetted with them in 1910s Germany. It did suffer from mid-film longeuers, but elsewhere, and in the final sequences in particular, with the farmer rushing through the wedding ceremony before the expected arrival of the Officer, the action was slickly handled, and with a light comic touch. I found it fascinating, but not entirely surprising, that Germany too in the 1920s had a pre-lapsarian view of pre-war rural life, just as was reflected in British culture of the time, and since. 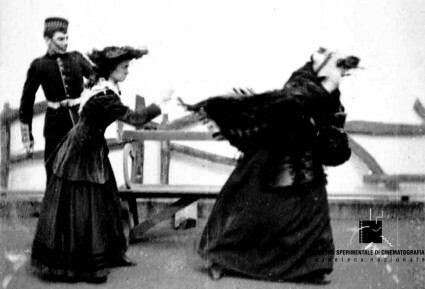 The second Corrick Collection programme was preceded by a rerun of The Soldier’s Courtship (UK 1896) and then started with a fine series of Niagara Falls travelogue shorts from 1906. Le Piege A Loup (The Wolf Trap) (France 1906) was a comedy featuring a man caught in a wolf (think bear) trap while his son, supposedly summoning help, plays with his friends instead.San Francisco and San Francisco Disaster (USA 1906) were two actuality films effectively acting as before-and-after scenes of the earthquake-hit city. Still dramatic and thought provoking after all this time. Great Steeple-Chase (France 1905) seems to be a rather fine film record of the 1905 running of the Grande Steeple-Chase de Paris, at Auteuil Hippodrome. Using a framing device of a family attending the racing, seeing (through a binocular-shaped camera mask) and being seen, thus making the social status of the event obvious. They place a bet at the Pari-Mutuel (French Tote) windows before watching the race and awaiting the posting of the result. The race coverage itself is of excellent technical quality – I lost count of the number of different camera positions used, stationed at the more spectacular jumps at the eye-level of the spectators, and right on the edge of the course; indeed a nasty- looking multiple fall threatens the camera at one point, the camera continues to film as the horses regain their feet and continue, remounted. The immediacy is striking, as is its modernity. I have not seen better film footage of horseracing prior to the 1980s. A real document. 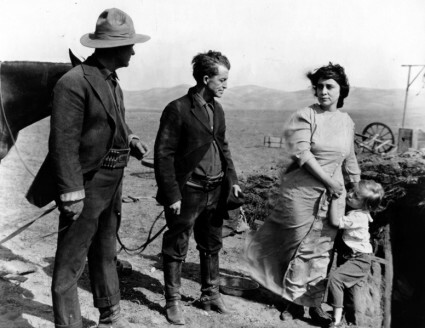 The Watermelon Patch (USA 1905) – as seen a couple of years previously in a different context – remains controversial, and uncomfortable viewing. Yes, it does feature pioneering editing techniques, and a delicious sequence of celebratory dancing from the black cast – but otherwise it’s a compendium of racial slurs and stereotypes, so while it can be filed under “Historically Interesting” I don’t particularly want to see it a third time. 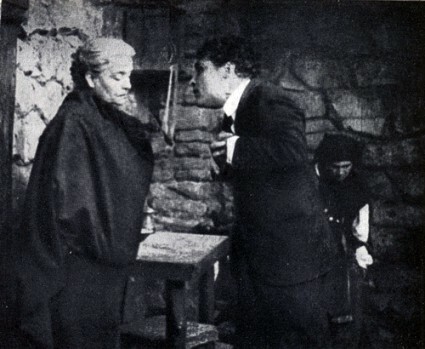 La Course a la Perroque (The Wig Hunt) (France 1906) is the sister film to Le Coup De Vent seen in the first programme; in that, the chase is that of a man after his hat; in this, an old woman (well, a man in drag) is trying to retrieve his/her wig after boys have attached balloons to it. Ohé! Ohé! Remouler (Hey, Hey, Grinder) (France 1906) was another French chase comedy, but a bit different and rather fun. A housewife wants her rather large carving knife sharpened by a passing travelling knifegrinder; her neighbours misinterpret her shouting and knifewaving as something more sinister, and try to chase her down and disarm her before she kills someone … Finally, La Fée aux Fleurs (The Flower Fairy) (France 1905) was a particularly good example of the coloured-flowers-and -pretty-girls-tableaux genre so popular at this date … Segundo Chomón for Pathé in this case. But enough of this fun and beauty; time for Hintertreppe (Backstairs) (Germany 1921), part of The Canon Revisited. An expressionist take on intimate drama, Henny Porten stars in (and produced) this vehicle designed to broaden her career into Art and out of the typecasting she was already subject to. She plays an ordinary housemaid embarking on an affair while being obsessed over by the local postman. The lover disappears; she writes, gets no reply – apparently, according to the catalogue notes, the postman had intercepted her outgoing post, though that was not obvious onscreen. When eventually she despairs, the postman forges loving replies, which surely makes no sense, but hey … it doesn’t end well for anyone, which may be no surprise, and the film was no success either. 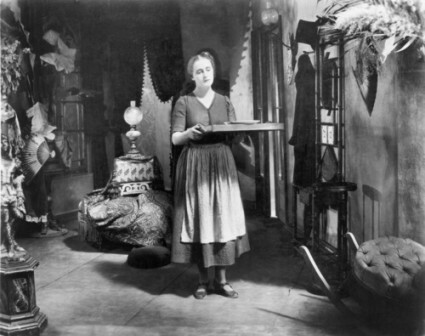 Henny went back to her lucrative and popular Hausfrau roles and left Expressionism to the cast and crew – Kortner, Leni and Mayer. Frankly, I can’t blame her; it must have been as much fun to play as it was to watch, and she was essentially paying the bills. 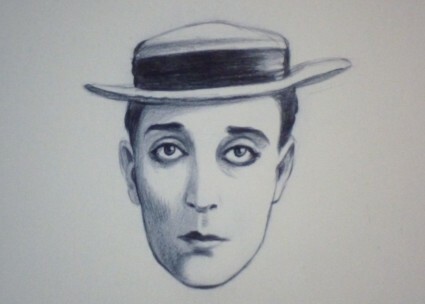 Incidentally, this was restored from an English print, with added intertitles for plot clarification (which didn’t help much) and possibly the most condescending introduction in silent film history; “Remember, these people are not like us; their bodies are adult but their emotions and behaviour are as those of children” or words to that effect. After lunch, more from Soviet Russia’s FEKS studio group, and S.V.D. – Soyuz Veligovo Dela (The Club of the Great Deed) (USSR 1927), a costume drama celebrating the 1820s Decembrist uprising fomented by a cadre of young army officers. 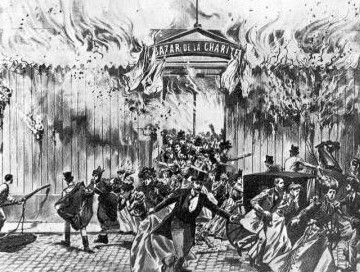 A story of idealism, betrayal and mystery, it was highly atmospheric with large sequences set in blizzard-whipped forests at night, gambling dens and circuses. Far more accessible than The Overcoat, possibly because the expressionism had been turned down a couple of notches, and what remained worked with, rather than against, the tale it was telling. Over to the smaller, and therefore packed Auditorium Regionale while the night’s orchestra rehearsed in the Verdi, for this year’s Jonathan Dennis Lecture, presented by Serge Bromberg and Eric Lange of Lobster Films, on the subject of the Voyage dans la lune restoration. Serge is a natural showman, always engaging and witty, but for once Eric emerged from his self-imposed (relative) silence; he speaks English! He too has a great sense of humour! Needless to say, the documentary Lobster are making on the restoration will not be entirely serious in tone – it was used as a source of illustrative material for the lecture, it is not yet finished – and Serge and Eric took us through the painstaking process of rescuing this unique print from the brink of death, and the ethical/philosophical choices made regarding the balance between restoration and recreation in that rescue. And also best guesses as to how the print came into being; on Edison format so prior to 1905/6; made for the Spanish market (not just that it turned up in the Catalunya Archive, but it had been given a Spanish rather than French tricolor); but the quality of the hand colouring suggests that it could only have been achieved at a top-quality French atelier, made for export. A fascinating hour-and-a-half, and I look forward to the documentary/film package when it is finished and released. The evening show will be long remembered; the longest queue in Giornate history I suspect, trailing all the way back to the Banco Friuladria on the other side of the town square, and which must have started forming a good hour before the doors opening time. 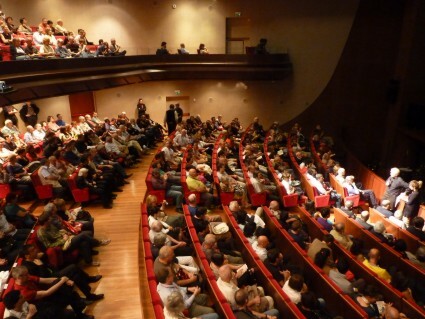 The event was ticket only, but with unallocated seating, and standing room only at that. I know the logistics are tricky, and that Mr Urbanora has expressed his opinion on allocated seating, but there has to be a better way … So, who was the queue honouring? That chap with the bowler and cane, still packing ’em in, 90 years on. Fortunately, in a masterpiece of programming, on this packed and prestigious night, the choice was not a physical comedy from a film student, but The Force That Through The Green Fire Fuels The Flower (UK 2011), a fully mature, bittersweet portrait of warm love grown cool, with a hint of redemption at the end. 8 minutes of beautifully composed images, in monochrome but set in today’s world, cleverly placed words in the film in lieu of traditional intertitles, telling a simple story with great sensitivity. A true 21st Century silent, and an instant classic modern short. 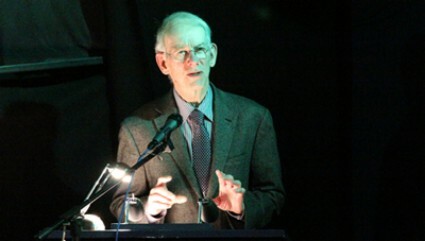 Take a bow Otto Kylmälä , a British-based Finn who attended the Collegium last year. 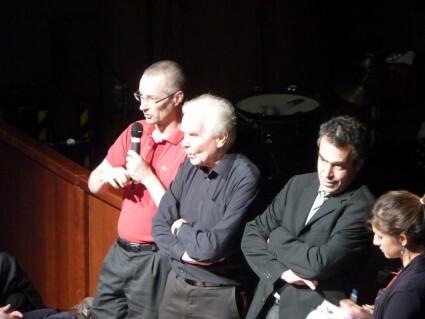 Kudos too to Stephen Horne’s live rendition of the score he recorded for the film’s soundtrack, and to Mr Urbanora who flagged the film here some time ago. And so to the main event, The Circus (USA 1928); Chaplin’s score, but played live by the Orchestra San Marco Pordenone, conducted by Günter Buchwald. Both did an outstanding job, once we had allowed Sir Charles to sing his theme song at the beginning. I won’t go on, as it should be a familiar enough film to you readers, but to say that, again, on a big screen with a live orchestra, and a large public audience, it still wins new converts, reiterates our admiration and just gives us a nudge that, yes, silent films still engage with the general public when the public are given the right opportunity. The reception was tremendous. The late film – follow that!! – was Khabarda (Out of The Way) (Georgia SSR, 1931) and it pulled it off, with Donald Sosin’s fine assistance. Unlike other entries from the Georgian strand I saw, this was deeply satirical and utterly surreal at times – if culturally and politically deeply suspect. Although the idea of demolishing the old to make way for the new is intrinsically anathema to fans of old films, and this film was at the vanguard of Stalin’s take on the Cultural Revolution, the film can be enjoyed in isolation if you temporarily ignore the message and the context. It’s technically well-made propaganda, a message delivered with skill, craft and with real verve and energy. Pity about the baggage it carries. All told, the day of the festival thus far. Stay tuned for the Mysterious X’s view of day six, when we shall encounter the Antarctic wastes (again), swordfighting Chechens, the wheatfields of Alberta, and the sounds of Denmark. Day three of the Giornate del Cinema Muto, and things kick off with another Disney Laugh-o-Gram, The Four Musicians of Bremen (USA 1922). Though still quite basic in style and reliant on repetitive action, this is a big step up from yesterday’s Little Red Riding Hood. It has little to do with the original Grimm brothers story, instead being an excuse for jazz-inspired invention (notably a dancing fish lured out of the water by the musicians’ playing), delighting in the self-contained world of nonsense that the animation medium permits, where any object can take a life of its own, and where dream logic rules. 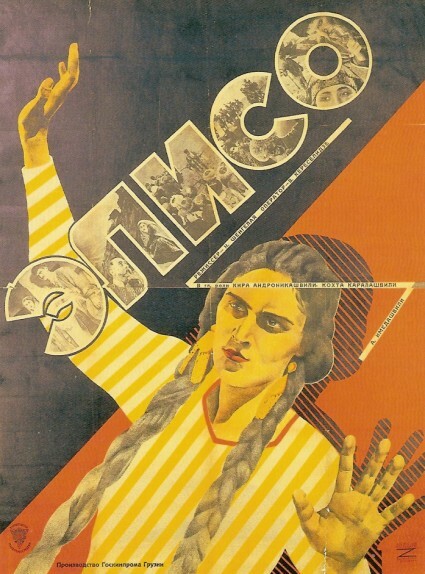 Our Georgian film for the day is Amerikanka (Georgia SSR 1930), which sounds like it is going to be fun just from the title. However it is not some sort of satire on things American, which I am expecting, but rather the dramatic and true tale of how a printing press was set-up in a Moscow shop basement in 1905 by Bolsheviks during the first Russian revolution – ‘Amerikanka’, or ‘American Lady’, turns out to be a name for a type of small Russian printing press. This is almost a great film; with better handling from director Leo Esakya it would have been one. It has a startlingly dramatic beginning, with two escaped prisoners in the snow, one of whom is shot dead, while the other is chained to him. How does he escape? We’re not told; he just does, and it is dramatic slips like this that confuse the audience and hamper the film. But anyway we follow the escapee to Moscow, where he and colleagues set up the printing press to produce revolutionary pamphlets which are secretly read all over the city. The authorities eventually track down the printing press and a battle ensues, but the narrative is not as important as the dyanamic style, in which the text/images generated by the press take over the screen, serving as sloganeering intertitles, turning the film itself into a revolutionary broadside. Form and intent merge as one, though one still wants a stronger grip on the story if we are to be moved and not just impressed. But a remarkable film all told. 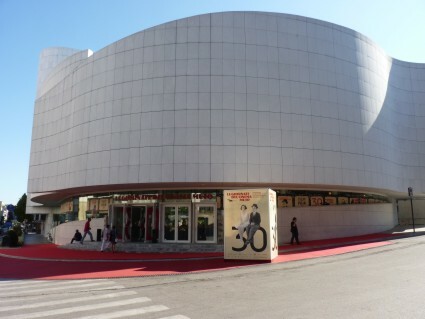 We have already written at length about The Soldier’s Courtship (UK 1896), the earliest British fiction film made for projection (I choose my words with care), recently discovered in the Cineteca Nazionale in Rome, where they have held the film for years but only recently established its identity. I will discuss the film in more depth in Day Four (a presentation is to be given on the film’s restoration), but just to say here that the film is a fleeting delight. The soldier and his sweetheart sit down on a bench and enthusiastically embrace; a woman of mature years sits down on the bench beside them and refuses to budge; his sweetheart remonstrates with him and encourages him to take action; he tips the woman off the bench and she leaves in a huff; the couple are triumphant, kiss, and share a cigar. The couple are played by variety theatre stalwarts Fred Storey and Julie Seale, and it is Seale’s bright, enthusiastic performance that stay in the memory. OK, it’s just a silly gag, but the Pordenone audience laughs at it – and then laughs all the more at the huge list of credits that follow the one-minute film (credits for its restoration, of course). More on The Soldier’s Courtship on the morrow. We are in the Early Cinema programme, but before we have the main body of films, there is another British discovery, this time from the EYE Film Institute in the Netherlands. The Indian Woman’s Pluck (UK 1912) is a Cecil Hepworth production employing the classical Rescued by Rover formula. A baby is kidnapped and the thieves are tracked down my the family’s faithful Indian wet nurse (played by Ruby Belasco). It’s rather well paced and shot by director Frank Wilson, with the nurse tracing her prey by following drops of blood down the garden path, until the child is returned too hurriedly and the nurse explains her actions with a bit too much gesturing. 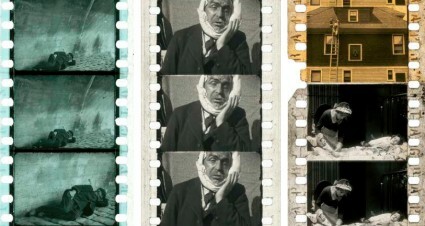 The main part of this programme is another collection of one-reelers from the extraordinary Corrick collection from the National Film and Sound Archive of Australia. 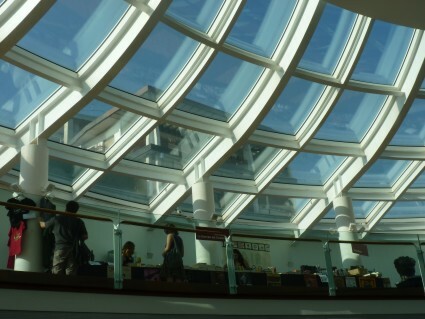 We have been treated to gems from this collection at Pordenone for a number of years now. The Corrick family of Australian travelling entertainers included films in their early 1900s shows, and they chose with care, because the quality of the titles in the archive they have handed down to us is consistently high. It is not going to be possible to go through them all here (the memory fades and the notes written in the dark have become all the more indecipherable). Stand-out titles include an awe-inspiring view of British battleships in a line at sea in Charles Urban’s Torpedo Attack on H.M.S. ‘Dreadnought’ (UK 1907); a spirited Pathé film on tobogganing down the Cresta Run, Sports d’Hiver: Le Tobogan (France 1905), so edited to make it look like the toboggan come down the ice in close succession when in fact one does not start until another has finished, a real sports film in its cutting and dynamism; [Sailor and Cop in Carpet?] (c.1904), an unidentified comedy, clearly British, in which a policeman and sailor argue, the former hides behind a carpet hanging on a line, then the sailor and a maid roll up the carpet and beat the policeman; a fascinating Edison proto-Western, On the Western Frontier (USA 1909) in which the use of painted backdrops for interiors and exteriors give a strong sense of the Western’s stage origins – the story is inpenetrable, but we can see cinematic ideas dimly evolve, though it would be more impressive if this were a 1904 film rather than 1909; an impressive Elephants Working in a Burmese Forest (Australia 1908), filmed by the Corricks themselves, which is notably absorbing; The Fakir and the Footpads (UK 1906), a Robert Paul trick film most engaging for including a Finchley road sign (a local signification from the filmmaker); and Personal (USA 1904), the famous Edison film which introduced the comedy chase genre (sixty years ahead of Benny Hill). We head out for coffee and an agreeable discussion about early aviation films, then start the afternoon with a trio of films from the Shostakovich & FEKS strand. FEKS stands for the Factory of the Eccentric Actor, the avant garde acting troupe established by directors Grigori Koszintsev, Leonid Trauberg and others and dedicated to bringing together popular dramatic forms (music hall, Chaplin, circus, commedia dell’arte, Keystone etc) in an exuberant kind of performance that naturally had a manifesto and an -ism to its name – Eccentricism. 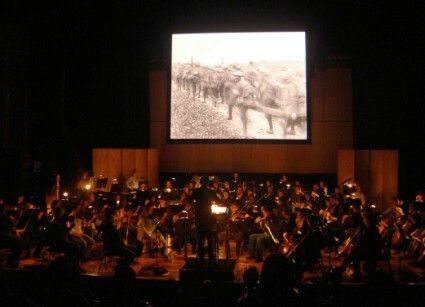 They put on stage productions and they made films, and Shostakovich wrotes scores for a number of those films. An early film production, before Shostakovich joined them, was Chyortovo Koleso (The Devil’s Wheel) (USSR 1926). Many greatly admired this tale (with reel three missing) of a sailor on shore leave who becomes mixed up with a Petrograd underworld gang, led by a stage magician called ‘The Question Man’. So I wish I could report more enthusiastically about it. It has some bravura fairground sequences (including the ‘devil’s wheel’ itself), and it all ends with an exciting battle, but looking beyond the style I find little to engage me (I even doze off for a while in the middle), and curiously I find more impressive a collection of fragments from the film which follows after, which may be outtakes or tinting tests. Divorced from narative, the fragments somehow highlight the directors’ vision more effectively; indeed the way in which they hide any story makes the connections between them seem all the more mysterious and inviting. But what a treat now follows. We have a screen test for Novyi Vavilon (New Babylon) (USSR 1927). The subject is Raisa Garshnek, who was a 17-year-old Sovkino laboratory employee. She didn’t get the lead part (they gave her a bit part instead), and seeing the screen test we can see why, but what is wonderful is that she is still with us, and we see a video interview with her, now aged 101. She has kept hold of the screen test all these years (the only surviving screen test from the Soviet silent film era), and brightly tells us of her time at Sovkino, casually mentioning that it was she who painted the famous red flag at the end of Battleship Potemkin. 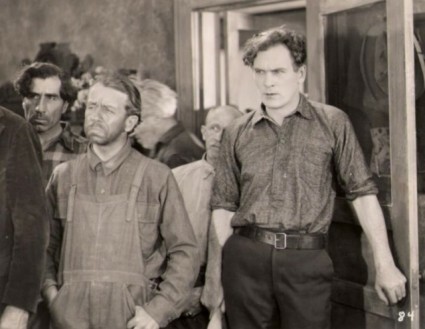 You don’t expect there still to be a human connection between today and a film which is now so iconic you cannot really believe that real people actually worked on it. Next up is the first of two programmes of Japanese animation. Of course, these days everyone knows something about Japanese animation, and Studio Ghibli is one of the best-known film production companies anywhere. This programme takes us to the roots of anime and the scarcely-known early history of Japanese animation. 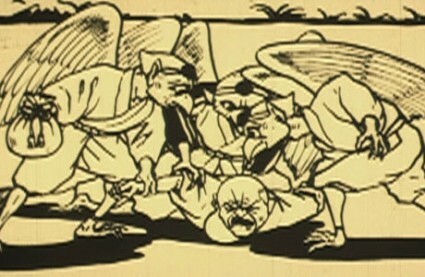 The earliest surviving Japanese animation film dates from 1917, though in 2005 a hand-drawn fragment dating from before 1912 was found (not thought to have been released commercially). 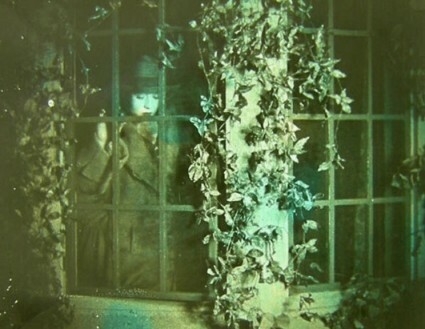 The Japanese animation films of the silent era are both familiar, in that they adopt basic techniques employed by American animation studios of the period, and strange, in that they take their films in entirely different directions – in theme, narrative, design and emphasis. They don’t look like later anime films (no large round eyes), but their very difference to the Western view gives them an affinity with the present-day work of Miyazaki and co. I must refer you to the excellent notes by Alexander Jacoby and Johan Nordström in the Pordenone 2011 catalogue, as without the context they provide the films you will only have my impressionistic, sometimes puzzled notes, because I cannot say that I always enjoyed the films that much. So we start with Namakura Gatana (Japan 1917), a mixture of rudimentary cut-out and silhouette animation about a samurai with a blunt sword, and Urashima Taro (Japan 1918), based on a folktale about a fisherman visiting the undersea domain of the Emperor of the Sea after rescuing a turtle, characterised by some elegant line, both of which were rediscovered in 2008 (something we reported at the time). The use of traditional stories and historical themes recur in what follows and distinguish Japanese early animation from what was being produced elsewhere. Kanimanji Engi (Japan 1924) is a rather creepy, unworldly fable about crabs who rescue a girl from a snake, made with silhouette animation. Some of the crabs die, indication of a bleaker attitude to life that characterises some of these films, certainly a long way off from Disney’s peppy, positive Laugh-o-Grams. Ubasateyama (Japan 1925) tells of an old woman whose great widom enables her to solve riddles; Chappurin to Kugan (c.1921-25) is an artless oddity about which little is known. It has a cartoon Jackie Coogan visiting Japan (Chaplin appears only briefly), and in common with a number of these films it seems hard to judge for whom it was made – it seems to be equally lacking in appeal for children and adults. Sanbiki no Koguma-san (Japan 1931), or Three Little Bears, promises a more Disney-like theme, but though it has a similar combination of animals and travel through surreal adventures, it has a lot less sugar to it (my notes refer to children weeping when the bears melt a snowman – or was it the bears themselves that melted?). Kobutori (Japan 1929) pretty much sums things up for me – who else who have considered even for a moment making an animation film about two old men disfigured by lumps on their faces? It’s a moral tale of two men who dance before odd bird-like creatures in the hope of losing their lumps; the good man is rewarded, the bad man ends up with two lumps. The artwork is fine and the narrative well-handled, but its sheer oddness I find bewildering. Another animation, another moral fable: Futatsu no Sekai (Japan 1929) was produced by the Ministry of Education and is based on the familiar Grasshopper and the Ant story. It contrasts the industry of those insects who work in summer with bourgeois idlers who, unprepared for winter time, fall into hardship, misery and even disfigurement. We are again reminded how life is unkind; Uncle Walt’s fables only tell us to have happy dreams. We finish off with Oira No Yakyu (Japan 1930), a spoof on the Japanese passion for baseball in a game played between rabbits and badgers (who look more like beavers to me). It starts off like an American animation (albiet technically inferior by far), then drifts off into more characteristic vein when the ball is knocked out into the countryside to be devoured by a frog. An interesting evening’s programme awaits, but I head off for supper and engrossing discussion, which touches on film archive politics, Creative England, the British Film Institute, the Lumière brothers, visual sociology, the BBC, the Digital Public Space, home movies, federated databases, the Delhi Durbar, the challenges presented to translators by rapid-talking film academics, YouTube, programming early cinema, the British Library, magic lanterns, showmanship, film lecturers, scholarship, CCTV, film lecturers, digitising film journals, and much else besides. And all that takes up five hours, and so the day ends. Please return soon for our report on day four, when we shall have offer you train travel with a hobo, a man suckled by a dog, a woman living underground, and an entire theatre quivering in horror at the sounds of the 21st century.